It all started on the stairs. 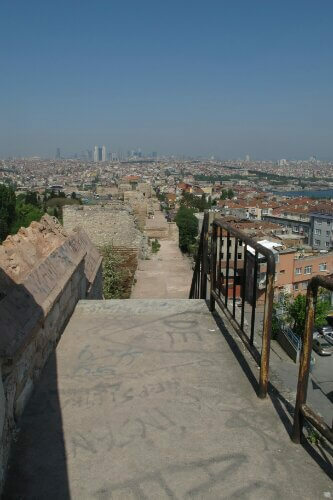 The stairs of the great Constantinople walls in Istanbul. These were not any ordinary stairs – these stairs were ridiculously steep and unfathomably narrow. There was room for your toes on each step but even the ball of your foot was left dangling off. “It’s easy,” the Mongoose tried to assure me. “Just pretend its a ladder, climb it like you’d climb a ladder,” he said. But it wasn’t a ladder, it was a hard, brick staircase that screamed death. Two minutes later my shoes were off and I was putting my right toes on the first ‘rung’ of the stairs. Matty was in front of me. The Mongoose was behind me. And slowly we made our ascent. 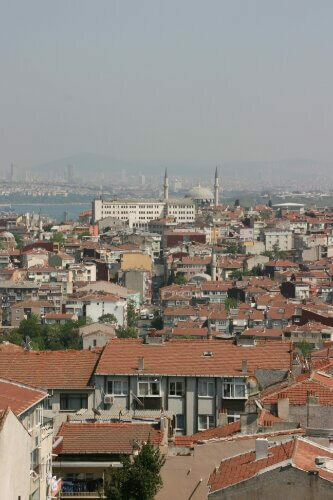 Before I knew it my knocking knees and I were standing on the top of the old Constantinople walls. We turned and faced east – the road to China – the road I would spend the next four and a half months travelling. We put our arms around each other. We took pictures of our feet. Our six feet that would travel more than 5,000 miles together. And we couldn’t imagine what the road ahead would have in store. It was the beginning of the Great Adventures of the Three Must-Have-A-Beers. A throw away comment made by my dad as he bid his farewells to us in London, which quickly became our label – our motto – the sentence that made me do the things I was scared of. “Come on Delia, we’re the Three-Must-Have-A-Beers, we have to do this together,” The Mongoose would say when I threatened to wait at the bottom of perilous mountains or treacherous staircases with the bags. And that is exactly what got me up those stairs that day. Yes, I thought, I trust these loons, we’re in it together. But that was some 7,000 miles ago now. 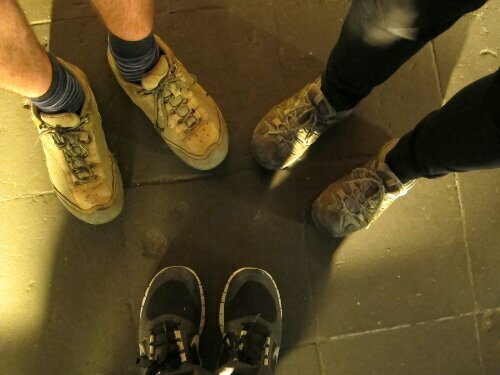 Technically 5,676 as the crow flies but we certainly did not travel like crows – we zig zagged our way across the Silk Road like a trio of drunk moles lost in a forest. Up, down, across and up and down again we went in Kyrgyzstan. From Georgia to Armenia and back to Georgia again before Azerbaijan. No we did not travel like crows. Although it often felt like we were flying. Or standing on the top of the world at least. I had to remind myself I was not on Mars when driving across the desolate, high altitude Pamir Highway of Tajikistan, known as the “rooftop of the world”, I had to assure myself I would get back to Earth eventually when stuck at the top of a mountain in a flimsy tent during a 12-hour thunder and hail storm, and I had to pinch myself when staring into the burning fire crater of the Turkmenistan desert. And after catching what must have been weeks of sleeper trains, days of buses and hours of taxis, we reached our final destination: Xi’an. 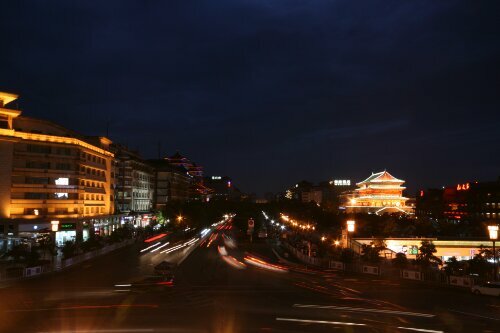 But our journey wasn’t complete the moment when our tired feets touched Xi’an soil after a long sleepless train from the west. 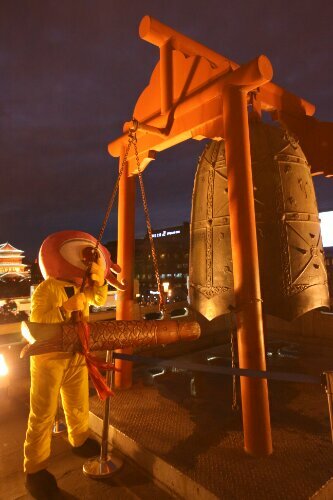 No, our final destination was the Bell Tower in Xi’an. And so we began the final walk of the Silk Road. 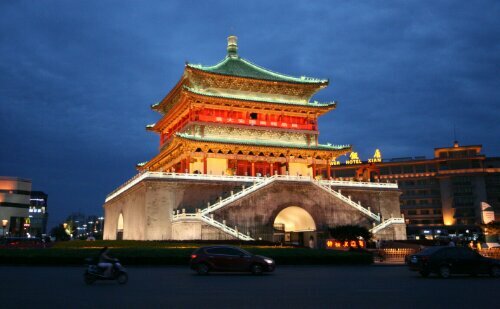 We paced down a colourful Xi’an street before coming to a sudden stop at the end. For we knew that as soon as we turned our heads to the left we would see the end of our road, and we weren’t quite ready for that. So instead we huddled together, put our arms around each others shoulders and shared a few words. The hugs got tighter, kisses were planted firmly on cheeks and then, with our arms still locked together, we turned the corner and saw it illuminated against the dark blue sky at the end of the road. The Bell Tower. And it was more beautiful than I could have imagined. We slowly strode towards it, clutching our bottle of ‘Champagne’, and did not stop until our palms were touching the cool brick of the tower. We had made it. We had completed the Silk Road. We had laughed, we had cried (well actually just me when I found out my friend’s baby had been born), we had travelled miles and miles together, without catching a single plane. And it was with all this emotion that three of us placed our hands on the huge piece of wood swinging besides the large, ancient bell at the top of the tower, ready to create an almighty noise. But security stepped in and we were abruptly shooed away before some giant fluffy character took it in his hands while rolling cameras filmed him posing with it. Of course. So instead we took pictures of our feet. And stared west – the road to Turkey – the road we had spent the last four and a half months travelling. And after we climbed down the stairs of the bell tower, a far cry from those of the Constantinople Walls, we popped the Champagne and lit a cigar. “To the adventures of the Three Must-Have-A-Beers,” we toasted. “And to all that we’ve seen…. This entry was posted in China, Recent Posts, Turkey and tagged The Silk Road by Delia. Bookmark the permalink. Love this…. You really get the emotion across!! Thanks Carol – it was a really emotional end to the journey. We all welled up a little before walking round the corner to the Bell Tower… Although don’t tell the boys I told you that! I have loved following your journey..a reminder of how wonderful it is to be young and free with the world quite literally at your feet. Congratulations on a great achievement and a fabulous diary ! Thank you so much Fiona. And it’s not over yet… Even though the Silk Road has ended we have some more exciting travel plans ahead. I promise to update soon! Congratulations! I’ve loved reading about all of your adventures! Thanks Rachel, it’s been lovely to have you along for the journey 😉 and it’s not over yet…! Hope all is treating you well back in the UK. So happy for you! I followed your journey through your words and pictures. What an adventure. Safe travels back home. Thanks Janet, it’s been lovely having your supportive words along the journey. We’re not heading back just yet. Next stop: Vietnam! Just tremendous altogether. I have enjoyed your blog so much and have felt transported from my flat in Dublin to places I didn’t even know existed. Its been inspirational. Congratulations to you all. Thank you Melanie, that was my aim so I’m so glad it worked out that way. Planning your trip to the ‘stans now?! What an emotional finale Delia. I’ve loved reading about your adventures! Well done Delia, Matt & Mongoose. 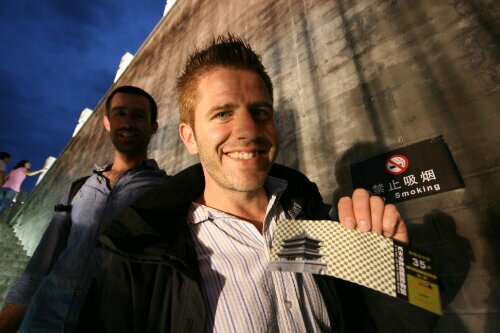 It has been great to follow your adventures through your blog and the photos have been excellent. Such an emotional end to an epic journey! Congratulations to the Three-Must-Have-A-Beers on completing your amazing journey along the Silk Route! I have followed your blogs with my trusty atlas at my side, and that and your great photos have taught me so much about an area of the world I knew next to nothing about – thanks so much. Good luck in Vietnam, and do post with your news when you can!